It’s summer and things are heating up! Everyone is packing a beach bag heading to the beach, lake or the pool to have lots of fun in the sun. 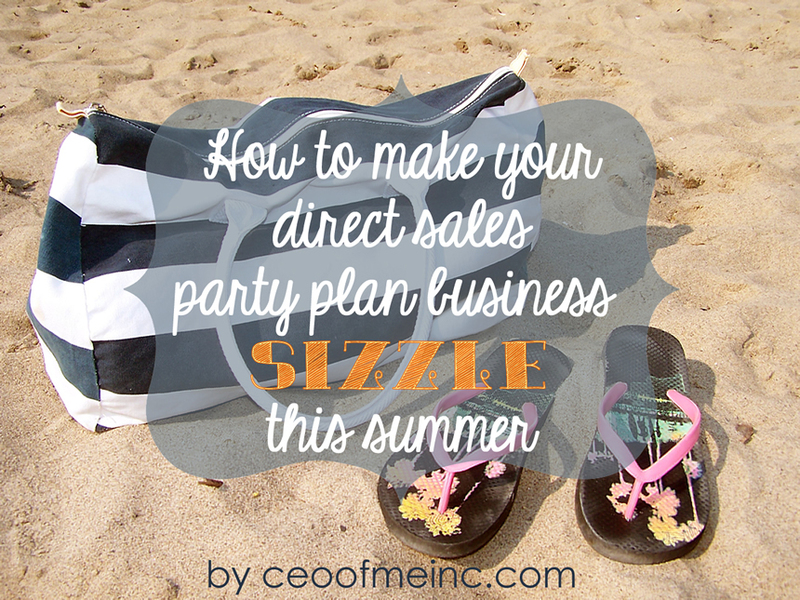 Your direct sales party plan business doesn’t have to wilt or get burned from the summer heat. You can make lots of money and have lots of fun in your direct sales business during the summer too. Here is what you need to make sure you have in your business beach bag so you can have a sizzling hot successful summer. •Swim Suit = Parties! Parties are the core of our business so be sure you always have parties booked. Cancellations and reschedules are higher in the summertime so be sure to over book. Offering fun, summer time themed parties will help you book more parties and have higher attendance at your parties too. A few of my host & customer’s favorite party themes include Luau, Garden Party, Party at the Park, Pool Party & Ice Cream Party. You can do these as home and online parties and even have fun with themed catalog parties too. •Sunscreen = Don’t let yourself get burned out in your business! You should apply training often. Attend your team and company’s regular training events. Stay connected with your fellow team members for accountability, motivation and support. Enjoy support and networking in the CEO of Me FB group too. •Sunglasses = Have on your Business Glasses on & look for new business everywhere! Always be on the lookout for new people, places and opportunities to share your business this summer. •Water Bottle = Stay hydrated & motivated. It’s important to keep yourself hydrated physically and mentally. Make personal development a daily habit. Surround yourself with positive influences and other motivated business owners. Read some new books this summer, catch up on training series you signed up for but didn’t finish or complete some business projects you have been putting off. Take care of your health too so you are able to work to the best of your ability. •Shovel = Determination! Be prepared to dig deep & work hard this summer to reach your goals. Don’t let yourself get lazy. Stick to a (flexible) schedule and be sure to do all the weekly activities you should be doing in your business. •Beach Ball = Build a Team & Bounce Up to Leadership! It’s not really much fun to play on the beach by yourself. You need a team to play with. Focus on recruiting, finding new team members and helping them get off to a strong start this summer. You’ll enjoy an increased income, leadership promotions and most of all be able to help others reach their goals. •Bucket = Something to carry all the money you will be making! That’s right, if you work your business consistently and apply these ideas you will be carrying home a big bucket full of money instead of just sand at the end of the summer. Buy yourself a beach bucket from the dollar store and write your goals for the summer on it. Put your beach bucket on your desk for daily motivation. •Flip Flops = To remind you to keep on moving. Remember NO means “next opportunity” and gets you one step closer to the next YES! Keep on sharing your business & moving forward no matter what! If you are you ready to heat things up this summer & want to learn how to avoid that dreaded summer slump that so many direct sellers and network marketers deal with, make some new connections, have fun & get the chance to win prizes while learning how to be more successful, then I would love to invite you to participate in my Summer Success Bootcamp during June 12-22! Days 6-10 – Bonus activities to help you implement what you have learned, take action and set yourself up for continued success all summer long! You’ll also receive a Camp Handbook (Workbook) & there will be other fun surprises! To participate all you have to is be or become a member of my CEO of Me Success Club! You can join & try it out for 1 month for only $37 & get access to the Summer Bootcamp training, tools & prizes plus my printable Success Planner System as a free bonus ($37 value by itself) and access to all other member benefits (training library, templates, tools, members’ FB group, networking events. If you decide Success Club isn’t for you, you can cancel anytime no hassle, no penalty before your next renewal but you get to keep the Success planner and any other training & tools you download while a member! REGISTER NOW TO JOIN THE SUCCESS CLUB & enjoy the Summer Bootcamp Training & all the other bonuses & tools! Be sure to join by June 11 to be part of the Summer Success Bootcamp! Oh my! What awesome tips!! Thanks for sharing!!! I am sharing with my team today!! I loved these tips! Thanks so much for sharing!